Discover Patagonia's stunning lakes, mountains and forests, hike to glacial lagoons dotted with flamingos, admire amazing glaciers such as the famous Perito Moreno, drive up into white-tipped hills for superb views of winding rivers and wooded valleys, cruise across mirrored lakes where Andean condors soar above and go trekking and canoeing to see a wide range of wildlife. Indeed, the main activity in Patagonia is hiking, as the region is filled with stunning national parks. Every year, thousands of trekkers come to towns such as El Chalten to explore the world-class treks found around the village and cross the border to Chile, to hike around the national park Torres del Paine, famous for its W trek. However for those who like to discover the landscape by other means and experience other types of sensations, Argentina is also famous for its gaucho culture and many other adventurous activities such as kayak, rafting, paragliding, and also skiing during winter. Travel to Patagonia and experience its astounding natural feature on this spectacular tour. From sprawling national parks to loud and crackling ice glaciers, imposing granite towers and diverse wildlife, Patagonia is a region to be explored by adventure junkies. Start your trip in Bariloche with an excursion on the Mount Campanario and the Circuito Chico, where you will get a first taste of Patagonia's spectacular landscapes. Then choose between the Tronador Multitrek or the Isla Victoria and Arrayanes Forest Boat Excursion depending on your wishes as well as weather conditions. Enjoy a free day in El Chalten, also known as the capital of trekking before continuing with a full day at the famous Perito Moreno as well as at the National Park Torres del Paine. Spend a free day in the town of El Calafate, which is rich in organized excursions, museums, restaurants and other activities for tourists. Finish your trip by staying two days in Ushuaia, the most austral city of the world, with a full day tour to Tierra del Fuego National Park and a sea lion colony half-day navigation. Discover the isolation, beauty and majesty of Patagonia on this action-packed adventure through one of the most incredible places on earth. This tour includes an expert guide, breakfasts, transport in Jeep, 4DW, bus, boat and ferry and accommodation in hostels and hotels. Travel overland from Santiago to Ushuaia, taking in spectacular scenery and enjoying outdoor adventures along the way. Beginning in Santiago, Chile's large, buzzing and modern capital, this trip journeys through the volcanic landscape surrounding Pucon. Enjoy a full day drive south to the beautiful Lake District of Chile and the lakeside town of Pucon, where you can choose from a range of optional activities, including a sunrise expedition to climb the Villarica volcano which looms over Pucon, heading out horse riding through the surrounding forests, or an evening visit to the nearby natural hot springs. After crossing the Andes into Argentina to continue your journey to the picturesque town of Bariloche via the scenic Ruta de los Siete Lagos (Seven Lakes Route), you will have a free day to enjoy the beautiful mountain town of Bariloche and the stunning surrounding lakes, mountains and forests. You will have the options to explore the area by foot, mountain bike, kayak, boat, or even a historic steam train. After crossing back into Chile and driving to the rafting mecca of Futaleufu, you will join the famous Carretera Austral, probably one of the most stunning roads in South America, surrounded in gorgeous mountain and forest scenery. The journey continues with a drive through the Chilean fjords to Queluat National Park and if time allows there is an optional walk to see the incredible hanging Colgante Glacier. After another drive day south through the magnificent Chilean scenery to the beautiful area of Cerro Castillo National Reserve, you will cross into Argentina's Patagonia region and continue your journey south along the famous Ruta 40 to reach the tiny town of El Chalten, situated in Los Glaciares National Park and famous for its incredible mountains, glaciers and world-class trekking opportunities. After a short drive to El Calafate, the gateway to the Perito Moreno Glacier, one of the most spectacular sights in Patagonia, your trip will continue in the wilds of the Torres del Paine National Park and finally ending in the world's southernmost city, Ushuaia. This tour includes 10 breakfasts as well as 10 lunches and 10 dinners, transport in overland vehicle, local bus, boat and ferry and accommodation in hostels, campsites and bush camps. Adventure across Chile and Argentina's southern fringes, a world ruled by breathtaking blue-tinted scenery and stunning ice formations that stretch as far as the eye can see. A combination of adventure and comfort, this trip gives you the best of both worlds, from world-class trails and glacier scenery to heartwarming, hand-made cacao. Begin your trip in Bariloche, an Argentinian resort town with a picture-perfect setting on the shores of Nahuel Hapi Lake, flanked by Andean peaks. Take a stroll through town and perhaps sample some of the town's famed artisan chocolate or try some of Argentina's first-rate steak. Discover the truly stunning scenery of the Cerro Campanario. In winter, the town is a popular center for skiing and in summer the focus shifts to walking, mountain-biking, horse-riding and kayaking and canoeing on the lakes - and if all that sounds too much like hard work, you can sit back and enjoy the view on a leisurely boat trip across to Victoria Island. In the afternoon, the group will be taken to the Hotel Llao Llao for high tea. Fill yourself with such delights as cakes, muffins, scones and sandwiches filled with local specialties such as smoked salmon. Visit a brew master who will share with you his knowledge and passion for micro brewing and enjoy further free time in Bariloche. Perhaps discover the scenic two-hour drive along Circuito Chico? This route begins on the fringes of town and culminates at Llao Llao, a resort area. If you're feeling active, you can cycle some of the circuit instead of driving. Cross the Andes via a series of beautiful lakes, finishing in Puerto Varas in Chile, where you will take in incredible views of the Osorno Volcano, the Puntiagudo Volcano and the Cerro Tronador, if the weather permits it. Enjoy free time in Puerto Varas, "the city of roses" where you will get the chance to practice many different water sports. Fly to Punta Arenas, the perfect base to load-up on any necessary supplies before embarking on a 2-day exploration of Torres del Paine National Park, where you will embark on a cruise to the incredible Grey Glacier and take a full-day vehicle tour around the national park. Your final destination will be El Calafate, the gateway to the Perito Moreno Glacier, which is one of the most spectacular sights in Patagonia. This tour includes an expert guide, 10 breakfasts, 2 lunches and 3 dinners, transport in private vehicle, boat and plane and accommodation in hotels. Grab your backpack and go on this 13-day trip to discover the amazing Argentinian Patagonia and its treasures. Travel across South Argentina and a small part of Chile, and get to know the beautiful landscapes that make this region so special. Travel through some magnificent Patagonian scenery beginning with San Carlos de Bariloche, the famous winter ski resort on the shores of Lake Nahuel Huapi. After crossing into Chile, discover Futaleufu, meaning Big River. The town, located in the region of Los Lagos, boasts some of the best water based excursions in all of South America on the Futaleufu River. Fed by the glaciers from the Lake District the river flows through the mountain range providing sensational views. Enjoy the fresh fast-moving waters where rafters annually descend to combat the rapids. Fly fishing and kayaking are also equally popular. Alternatively, if you prefer your excursions land-based, you can enjoy full day hikes through the valley or visit Futaleufu National Reserve known for its large amount of Huemul (South Andean deer) and expansive trails. Then, from Puyuhuapi you will be able to visit Parque Queulat National Park. Situated on both sides of the Carretera Austral highway it is a realm of evergreen forests and winding rivers, with a large variety of flora and fauna living amongst it. If you are lucky you may get the chance to spot a Pudu, the smallest deer in the world, as well as a plethora of birds. It is perhaps most famous for it's hanging glacier, Ventisquero Colgante, located east of the Carretera Austral. Marvel at the long sheet of ice suspended off large rock faces, as nearby waterfalls cascade towards the bottom of the glacier. You can also indulge in the Puyuhuapi hot springs after hiking through the National Park's beautiful surroundings Visit Coyhaique, the capital of the Aysen region, the city is set amongst a backdrop of scenic mountain ranges, providing a perfectly unspoiled landscape. You can browse the local craft fair at the main square of Plaza de Armas, where locals sell handmade leather, wool and stone products. Heading towards El Chalten, you will spend a night in the town of Perito Moreno and visit the Cuevos De Los Manos, where you can see spectacular artwork painted on the walls dating from 7300 BC. Arriving in El Chalten, you will explore Los Glaciares National Park is renowned for its spectacular scenery, and a fantastic place for trekking. Options include half or full day treks to Lago Capri or various other trails to take in the views of the Fitzroy Massif and the many nearby glaciers. After a small drive to El Calafate, enjoy the great views of the Perito Moreno glacier. Travelling on, you will come to the misty port town of Puerto Natales, an important base for agriculture and tourism. The best way to discover the national park Torres del Paine is on foot and trekking here will take your breath away. From the comfort of our camp-site situated just outside the national park, you will have the opportunity to go on full day treks into the park to explore its beautiful scenery. You will also have the option to take a scenic boat trip across Lago Pehoe for a full view of the Grey Glacier. Visit the most southern city in the world, Ushuaia and its setting that's hard to beat, dramatically located between towering mountains and icy sea. Finish your journey in the beautiful city of Buenos Aires, also known as the "Paris of South America" due to its lovely green parks, plazas and wide boulevards. This tour includes an expert guide, 20 breakfasts, 7 lunches and 3 dinners, transport in bus and plane and accommodation in hostels, hotels and camping. Explore the thrilling and unspoiled vastness of the Patagonia region on this journey to the end of the world. Starting in the lively capital city of Santiago, jump right into the fun of this tour by heading to Santa Rita Winery, where you'll learn about the wine-making process and taste, blend, and bottle your own wine to take home with you! On your tour of Santiago you'll be surprised at how a city of so many people can be so well kept and vibrant-a city packed with local parks, artwork at every turn, and European-style squares. On to Puerto Natales for a night before staying inside scenic Torres Del Paine National Park for two nights. Jagged peaks, glistening green waters, glaciers, and powerful falls set the stage. 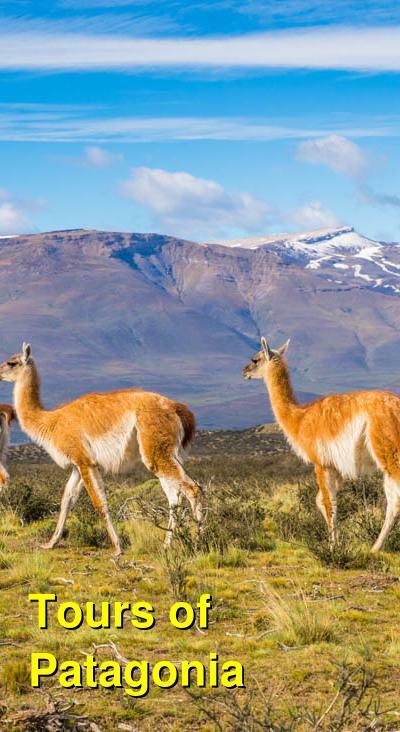 You're sure to glimpse some of the wildlife here, like guanacos, foxes, birds, and if you're lucky, the elusive puma. Cruise on Lago Grey to see famous glaciers and floating icebergs; visit the famous sites of Chile's largest natural reserve; and even trek through a rugged and unspoiled rainforest to see cascading waterfalls on these two days of unspeakable scenic beauty. A highlight of this tour is undoubtedly your visit to El Calafate, home to Perito Moreno Glacier, one of the largest in the world and still advancing! You'll have the chance to walk on catwalks overlooking the glacier and, with luck you'll witness glacier pieces calving into the waters below. You also experience the massive Upsala Glacier by boat-a different experience that allows you to marvel at the color and sheer masses of these glaciers. Follow this with a visit to an estancia (ranch) on the shores of Lago Argentino for lunch and your choice of activities, such as a 4-wheel drive tour or trekking. From El Calafate, descend to Ushuaia, the end of the world! Cruise Beagle Channel, watching for albatross, sea lions, and skuas while you marvel at the sheer idea of standing at this point on the globe. You also visit Martillo Island for a chance to see Magellan penguins. In Tierra del Fuego, an expert Naturalist will lead you around the delicate ecosystems of this southernmost national park. Head north to Buenos Aires, where you will conclude your Patagonian journey with exciting new adventures like a wine tasting with a local sommelier in a Cava setting and a visit to famous Recoleta Cemetery. And no visit to Buenos Aires would be complete without a lesson in the sizzling, sensuous Tango! This tour includes an expert guide, breakfasts, 6 lunches and 5 three-course dinners, transport and accommodation. See also our Ultimate Guide to Patagonia.